If you’ve ever experienced shoulder pain—and most people have—you know how difficult it can be to recover. The shoulder muscle is engaged when performing a surprising number of tasks. From carrying something, such as a bag of groceries, to lifting objects and even sleeping on your side, inflammation in the shoulder area can cause a lot of discomfort. And if you have the misfortune of suffering from a frozen shoulder, symptoms can be even worse. Frozen shoulder—or as doctors refer to it, adhesive capsulitis—creates a great deal of stiffness in the shoulder joints and tendons. It usually affects those over the age of 40, appearing more often in women than men. What is frozen shoulder and why does it happen? There are three main bones in your shoulder joint: the humerus (your upper arm bone), the scapula (which is your shoulder blade), and your clavicle (or collarbone). Where your humerus meets your scapula, there is some connective tissue called the shoulder capsule. This capsule surrounds not only your shoulder joint but also the rotator cuff tendons. Around the shoulder capsule is some lubricating fluid called synovial fluid. When your shoulder becomes frozen, this protective capsule loses some of its synovial fluid and becomes tight and inflamed. Adhesions—stiff bands of tissue—may also have developed in the shoulder joint. Once a shoulder joint is frozen, it can stay that way for up to six months. Range of motion can be severely limited and keeping up with daily activities might seem next to impossible. For some, recovery can take upwards of two years. Doctors still don’t know what exactly leads to frozen shoulder. No one occupation or motion has been found to trigger the condition. What medical experts do know is that people with diabetes tend to be more susceptible to getting frozen shoulder, as well as those with an under-active or over-active thyroid, Parkinson’s, or heart disease. One final potential cause is immobilization. If you’ve had surgery and/or suffered an injury and you can’t move your shoulder for a period of time, you’re more likely to end up with a case of frozen shoulder. This is why it may be a good idea to move your shoulder soon after an injury or surgery to prevent the shoulder from becoming “locked” and inflamed. Talk to you doctor about this, however, before plunging into exercise that might be too strenuous for your particular situation. The good news about frozen shoulder is that most people (over 90%) can significantly improve their condition by following some simple treatments. This includes strengthening the shoulder and performing physical therapy. A physical therapist is highly recommended to get you well on your way to recovery. If that’s not a possibility, a home program of exercises that stretch the shoulder and slowly restore its range of motion could also do the trick. You can also apply heat periodically to loosen up your shoulder. “Frozen Shoulder,” American Diabetes Association web site; http://www.diabetes.org/living-with-diabetes/complications/related-conditions/frozen-shoulder.html, last accessed July 23, 2013. 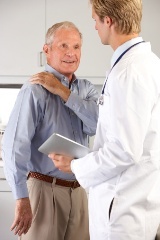 “Frozen Shoulder,” MedlinePlus web site; http://www.nlm.nih.gov/medlineplus/ency/article/000455.htm, last accessed July 23, 2013.